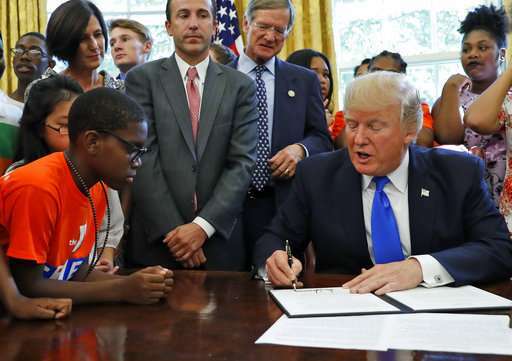 US President Donald Trump on Monday ordered the Education Department to invest at least $200 million annually in grants funding schools in the country so they can expand their teaching in the areas of STEM (science, technology, engineering and math). “Greater access to STEM and computer science programs will ensure that our children can develop the skills they need to compete and to win in the workforce of tomorrow,” Efe quoted Trump as saying. The president signed a memorandum instructing his Secretary of Education Betsy DeVos to prioritise educational projects related to STEM and computer science when it comes to distributing funds to schools. “So we’re very excited about today’s announcement and towards really focusing on the goal of putting Americans to work and making sure that all Americans get great-paying jobs,” Ivanka Trump added. Be the first to comment on "Donald Trump directs $200 million annually to sci-tech education"